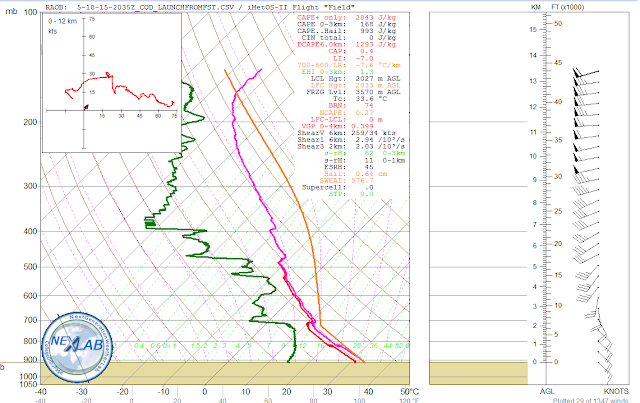 Monday featured a well-mixed boundary layer with dewpoint depressions in the 30F range. While we did not think the environment was favorable for significant tornadoes, we were still very interested in tracking isolated supercell development rolling off of the Davis Mountains in southwest Texas. After getting on the road, we stopped for a quick lunch in Midland, TX, before travelling to Fort Stockton, TX as an initial target. Our plan was to get to Fort Stockton and launch a weather balloon from the western edge of the better boundary layer moisture. We met up with the U.S. Naval Academy field group (led by Drs. Brad Barrett and Gina Henderson) in Fort Stockton in anticipation of the launch. It was nice to mingle with their group and send up our first successful weather balloon launch from the field! As we launched the balloon (video below) convection was beginning to form near the Davis Mountains as expected. 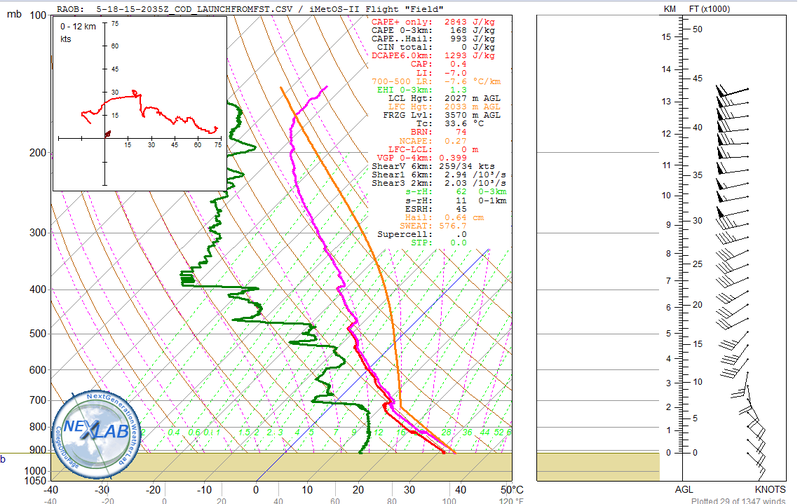 Our sounding confirmed the suspicion that LCLs were too high for a significant tornado threat. After the balloon made it into the stratosphere, we packed up and headed toward Pecos, TX, where the storm was now maturing into a beastly supercell with very large hail. We sat southeast of Pecos for several hours watching this nearly stationary storm. It had some nasty inflow (we measured several gusts over 35 mph) but always seemed to have a strong surface cold pool within a few miles or so from the storm. In fact, it really never had an established updraft area location. Nevertheless, it was a very pretty storm and made for easy chasing given the slow storm motions. After it was clear the storm was not going to get any "better", we fled north behind the core to get back to the interstate (in hindsight, I should have just navigated the team an extra hour out of the way back toward Pecos). On the way, we encountered the worst flash flooding I have ever seen in my life a few miles south of Coyanosa, TX. We saw (at least) three vehicles swept off of the road into the rapidly rising water! Hail drifts created dense hail fog as waters continued to rise and roads completely covered with at 4-8 inches of water. We found a high/dry spot and waited the worst of the flooding out, but training thunderstorms were creeping from the southwest and I was worried that things we about to get a lot worse. We got in a train behind some larger vehicles who went first and created a nice wake for us that we were able to comfortably get through. I am very happy we were able to get out when we did, because we found out later from the NWS that this area now has over 4 ft. of water covering the road! MISC: Overnighted at the brand new Courtyard in Lubbock, TX for the second night in a row.